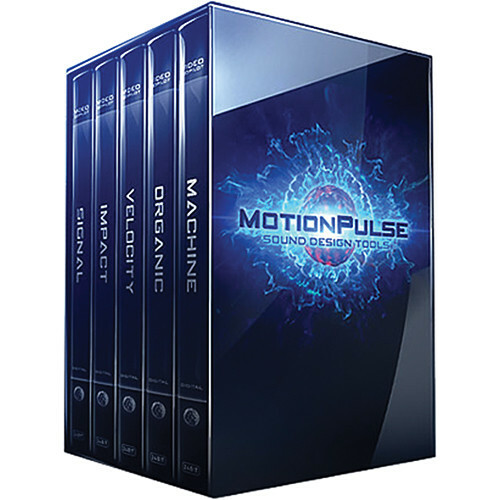 MotionPulse BlackBox from Video Copilot is a collection of sound effects designed to complement motion design graphics. It features five libraries made up of 35 categories, providing a total of 2000 unique sound effects. The five effects libraries are: Machine, Velocity, Organic, Impact, and Signal. The collection is ideal for Movie Trailers, Motion Design, and Special Effects applications. Each sound effect is fully mastered and can be used by itself, or layered together to create new sounds. The effects are available in WAV and MP3 files at 24-bit, 96 kHz quality, and ready for use in most audio/video applications such as Adobe Premiere Pro, Adobe After Effects, Adobe Audition, Sony Vegas, Final Cut Pro, Pro Tools, and Logic Pro. This product license may be used on one workstation and one personal computer, such as a laptop or home computer, granted the systems are used by the same user.